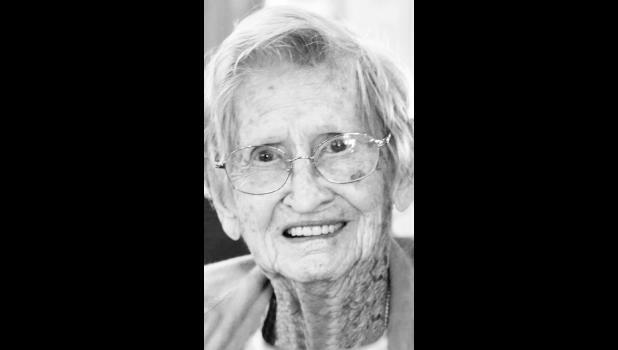 Dorothy A. Beightel, 104, Holton, died Monday, Jan. 22, 2018, at Vintage Park in Holton. She was born March 14, 1913, in Springfield, S.D., the daughter of Thomas James and Lily Pearl Guptil Kane. She attended Anaheim High School in California and later earned her G.E.D. at age 65. Mrs. Beightel was a homemaker. She was a member of Circleville United Methodist Church, East Grant Club and Pleasant Valley Neighbors. She married Gerald M. Beightel on May 21, 1938, in Hiawatha. He died Oct. 23, 2014. She was also preceded in death by a sister, Mary Everett; five brothers, Phillip, Mark, Joseph, John Hubert and Robert “Bob” Kane; a granddaughter, Mary Patricia Wichman; and a grandson, Dustin D. Christian. Survivors include six children, Mary Ellen Edwards, Holton, Geraldine Moore, Maple Hill, Susie Wichman and husband Verlin and Bob Beightel and wife Linda, all of Holton, David Beightel and wife Jan, St. Louis, Mo., and Virginia Christian and husband Steve, Topeka; 16 grandchildren; and numerous great-grandchildren and great-great-grandchildren. Memorial services will be held at 2 p.m. Saturday, Jan. 27 at Mercer Funeral Home in Holton. Family will greet friends one hour prior to service time. Memorial contributions may be made to Jackson Heights Honor Flight or Beck-Bookman Library, sent in care of Mercer Funeral Home, P.O. Box 270, Holton, KS 66436.